ISS Australia have a new fleet of Kubota Tractor Australia’s equipment to take up the challenge of maintaining the Shire of Melton’s parks and gardens in outer Melbourne. In order for ISS Australia to fulfil this contract Ian Goding and Charlie Payne of Godings delivered a range of new Kubota tractors, mowers and a RTV900 utility vehicle to Scott Howells and Neil Bailey of ISS Australia. With a fleet of 200 plus pieces of Kubota equipment spread all over Australia, ISS Australia are the largest single users of Kubota equipment in the nation. “To complete our contracts efficiently, it is important that we have the latest and best technology available, and Kubota equipment passes every test we have given it. ISS have several machines working in remote areas such as the Pilbara region of Western Australia and Kubota reliability has been excellent” Scott Howells said. ISS Australia provides superior maintenance services for a wide range of clients including Local Government, Department of Defence, Vic Roads, major shopping centres as well as industrial and commercial clients. 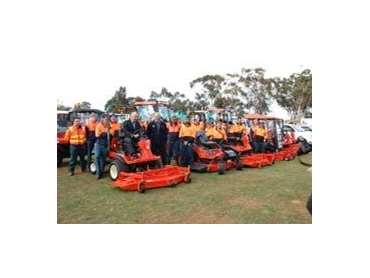 Their Openspace Division which specialises in turf renovation and maintenance, gained experience using Kubota Tractor Australia’s equipment working with their customers which in turn made ISS aware of the advantages of running Kubota Tractor Australia’s products.